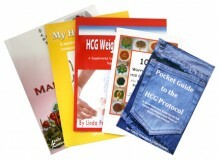 The Pocket Guide to the HCG Protocol by Tiffany Prinster and Linda Prinster is a travel-sized version of the HCG Weight Loss Cure Guide by Linda Prinster. This small, thin book is easy to take with you to the grocery store or out to a restaurant while on the HCG Diet. This HCG book begins with a brief summary of the phases of the HCG Diet along with some HCG tips and tricks, and then delves right into the massive HCG food chart we know and love from the HCG Weight Loss Cure Guide. The HCG food list in the Pocket Guide to the HCG Protocol has all different kinds of beverages, proteins, fruits, vegetables, nuts, dairy products, snacks, condiments, and on and on. For each item you get the nutrition information (sugar, fat, protein, carbohydrates, etc.) and in which phases of the HCG Diet they are allowed, not allowed, or cautionary. It’s very helpful and very easy to take with you wherever you go, so you can be confident in your HCG food choices from beginning to end of the HCG Diet.